See also Houses One by Scretch, Houses Two by Scretch. Info: Created on 26th December 2015 . Last edited on 1st January 2016. Thank you for your comments. I have not been on Fontstruct for a while, but wanted to try this when I could not find the images I was looking for on the web...to be used in a flash movie. Looks great - good luck with the movie. Thanks. I just finished the movie, as part of a popular series on my web site (called Tinsel Town Tempo). They worked out well. 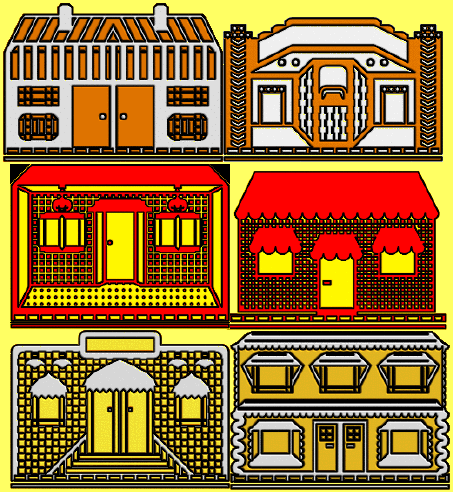 I added 9 more storefronts to this font. Now I'm done! Congratulations! FontStruct Staff have deemed your FontStruction worthy of special mention. “storefront” is now a Top Pick. Thank you for the special mention. These were fun to create. Also, I used the font in a movie which can be seen here. Click the Mr BoJangles link on this page. Good luck with your essay. Thank you for your comments. Thank you for the compliments. If you click on the index link at the bottom of the video link page, you will find a whole series of videos, which I am still currently working on. Thank you, this was fun to make.